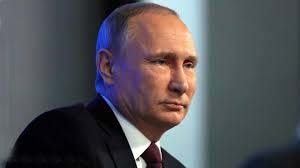 Vladimir Putin born 7 October 1952 is a Russian politician who is the current President of the Russian Federation, holding the office since 7 May 2012. He was Prime Minister from 1999 to 2000, President from 2000 to 2008, and again Prime Minister from 2008 to 2012. During his second term as Prime Minister, he was the Chairman of the "United Russia Party", the ruling party. German media, Die Welt, revealed the secrets of the success of the President of the RF. None of the politicians of the world does end 2016 as well as Russian President Vladimir Putin , according to the newspaper Die Welt. The journalists of this publication, are wondering how the Russian leader was able to provide optimistic prospects for his country, as well as what his secret to success. The authors of the material noted that one of the key Putin's ability is the ability to extract the maximum benefit absolutely from any resource. Experts predict a positive trend for the Russian economy, as well as a significant strengthening and modernization of the army. In addition, according to the publication, Putin knows how to use his power in the right way. For example, with the help of the Russian authorities to Syria could turn the tide of the conflict on the territory of the CAP, as well as completely free of Aleppo of insurgents. Putin also has authority in the state, noted the journalists of Die Welt. They have suggested that if the president will re-run for the presidency in 2018, he will be re-elected again. They outlined the progress and achievements of the Russian leader and his impact and other policies, not sparing the loud statements of Putin. As the study authors note, even the hype around the hacker attacks that was attributed to Russian hackers - even without reasons - still strengthened Putin's figure in the eyes of the world. In addition, one of the factors that influenced the rise of Vladimir Putin's importance in the international arena was the failure of foreign heads of state, who were unable to cope with the difficulties in 2016. As examples of the lead authors of the article Angela Merkel, Francois Hollande, head of the EU Jean-Claude Juncker and others. In conclusion, the journalists at "Die Welt" stressed that Putin managed exactly "to get into the stream" topical issues discussed at the moment in Europe and the US. It is noted that even opponents of the President of Russia for its sometimes harsh statements help him win. Vladimir Putin celebrates success after success. At his annual press conference, he praised Trump and described the Aleppo conquest as a "humanitarian action". Its weakness remains the economy. "How do you feel in the armchair of the most influential man in the world?" Asked a journalist of the Russian state television Putin. For the voters, it is very pleasant to see that the Russian president is so powerful. And indeed: whether Putin is now actually the most powerful man on the planet, can be said. What was clear on Friday at his annual press conference: 2016 was an almost perfect year for the ruler of the Kremlin - and no politician could expand his power as much as Putin. This applies to the war in Syria , where Russia swung to the trend-setting power in the Middle East. At the same time Putin looks at the 2017, in which if the future US president Donald Trump could be completely new options for the expansion of its global power in Europe and in the world. Even on Friday morning, before the beginning of the annual press conference, Putin gave a demonstration of his power. On the table between Vladimir Putin and the Defense Minister Sergei Shoigu the TV spectators saw maps spread of Syria. Schoigu told the President about the military situation. "I know that the operation in Aleppo was ended with the liberation of this important city of Syria," Putin said at the beginning of the meeting. The regime of Assad declared on Thursday to have taken the city, the Russian state television showed pictures of jubilant Syrians with Russian flags for the occasion, which was for the Syrian regime and for Putin an important victory the case of the rebel stronghold Aleppo. While Russian and Syrian bombers laid the city in ruins, the West remained indifferent to rhetoric and did not interfere. In the end, the fate of civilians was decided in talks between Russia, Turkey and Iran. Later at the press conference, Putin spoke of the "greatest humanitarian action in the modern world nowadays" - which sounded cynical in the face of the brutal air raids on civilians in Aleppo. For over a year, Russia has been supporting the Syrian regime with air force, artillery, special forces and mercenaries. "It is hoped that a peace of arms will be agreed for the entire Syrian territory and that a political solution should be reached, which should be shared by regional powers and the US," Putin said. He can speak calmly about this, because he knows that his army has significantly strengthened the Syrian dictator Bashar al-Assad within a year - and made Russia itself the determining force in the conflict. Putin's foreign policy balance this year is very successful. His success in Syria was also possible because the outgoing US President Barack Obama was not willing to act decisively. The next US President, Donald Trump, had said during his election campaign that the US had "bigger problems than Assad". Russia was therefore able to return to the Middle East as an influential player. The victory trumps also played Putin in Europe - because he reinforces tensions between Russian friends and Putin opponents on the continent. Putin can hope that the West will be even less united in the coming year. Ronald Reagan would turn back in the grave if he saw that today 37 per cent of the Republicans are opposed to Putin, the reporter said. No, Reagan would look forward to the President-elect, "Putin said. Trump "felt very fine the mood of the company," he said. "He pulled it through, though no one but us believed in his victory." While Putin denied the allegations, Russia had interfered in the US election campaign , but only halfheartedly. The current government is trying to blame for its defeats on external factors. The hacker attacks on the Democratic Party, for making the US intelligence Russia responsible, however, he said: "The most important thing is the information, who asked the hacker to the public." This is more important than the question of who is behind the Attacks. "As the designated US President rightly said: Who knows who these hackers are?" Putin refused to criticize Trump even when it was about nuclear weapons. According to the Russian President, the statement that the US must significantly increase its nuclear capacity is not unusual. Rather, the statements of the current US government surprised him. After Putin's speech at the Ministry of Defense on Thursday, he said the US army was the strongest in the world. "Nobody denied that," Putin said. He had just said, "The Russian Federation is stronger than any potential - respect! - Aggressor." Whether this means that he no longer considers the USA a potential aggressor, Putin has not specified. The army and the nuclear forces would be further modernized. The United States had created the basis for an armament contest with its decision to build the missile shield in Europe. The rise of right-wing parties in Europe and the growing doubts about European unity as well as the transatlantic partnership this year are also playing into the hands of Putin. He assured on Friday that Russia was interested in a strong Europe, but again made a mocking comparison between the EU and the Soviet Union: in Brussels more decisions were made than in Moscow in the Soviet Republic. Russia is also interested in a Europe which is independent of a "third country" - independent of the USA. However, a majority of the questions at his annual press conference were devoted to internal problems of Russia. Here, Putin had less success in the year to come. The Russian economy has no prospect of a rapid improvement. Putin's best news to the listeners: in 2016 he expected the economy to shrink by only 0.5 to 0.6 per cent, which is less than in 2015. Inflation and the outflow of capital have declined. A recipe for the growth he had visibly not ready.